Virtually all Jacksonville Shell Club members of whom inquiry has been made are aware that hermit crabs inhabit empty gastropod shells. Such behavior is necessary for the crabs' survival as their abdomens, unlike those of their freer-living cousins, lack the protection of a tough exoskeleton. Without the protection of their "shells," these hermits would be easy prey for a variety of carnivores. Many biped shell collectors must credit hermit crabs for providing important specimens for their cabinets - in some cases all or most known examples of marine gastropod species were "crabbed." This is especially true on bottoms too deep for SCUBA and too unforgiving to trawl or dredge, where traps such as "lobsterpots" constitute the only practical collection technique. The vast majority of gastropod species are herbivorous or otherwise possess a very specialized appetite or feeding strategy and would not be expected to enter such traps, which are generally baited with dead fish. It's the nearly ubiquitous hermit who provided transport for the likes of pleurotomarian, trochid, Bursa, Morum, and Lyria shells into these traps (and thereby into collections and the scientific archives). Shallow-water collectors, while not quite as dependent on the crab's provenance, do appreciate the services of these industrious arthropods, who were recycling hardware millennia before it became a cause célèbre. Many J. S. C. members have observed and collected hermit crabs and their "shells" during various field trips, especially to the intertidal flats of Cedar Keys. There one can see crabs marching about in the shells of any of a dozen or more snail species of many sizes and shapes. The trails composed of the tiny footprints of the crab allow differentiation from the simple furrow produced by the living mollusk. A few years back Don Campbell showed some fine slides at a club program which dealt with the trails of these and other marine invertebrates - most of all of which can be seen au naturel at Cedar Keys. Over New Year's holiday the writer took note of a new kind of trail in the vast mud flat near the Beachfront Motel, Cedar Key. Several small snail shells were plucked from the end of unusually serpiginous tracks and were found to have an unusual soft-bodied inhabitant. About two dozen "live" specimens of about a half dozen species (shells) were kept in seawater and placed in a Petri dish on return to Jacksonville. Under the stimulus of a photoflood, the specimens came to life. As can be seen from the accompanying photos, the shells weren't inhabited by their original tenant. A worm had taken up residence in an otherwise empty shell. The critters moved about vigorously, twisting through 360 degrees in all planes, pulling the shells along at times, and moving in and out of the shells (never completely), sometimes extending a remarkable distance from the aperture (see photos below). Often the end of the extended worm would exhibit a ring of delicate appendages around the terminal opening. As the worm retracted into the shell, this opening and crown would clearly turn in on itself like the finger of a rubber glove (or the eye-stalk of a Liguus). These worms are members of the phylum Sipuncula, which is distinguished by having a coelomic cavity, U-shaped gut, no segmentation or setae, and the already-observed "introvert" with its terminal mouth surrounded by "tentacles" (Laverack and Dando, 1979). They feed on detritus picked up by the foraging action of the introvert in marine sediments. Several species appear to be wed to empty gastropod shells for life - occupying no other known niche after their one to two day existence as trochophore larvae in the plankton. The Cedar Key species is Phascolion strombus (Montagu, 1804), which ranges throughout the North Atlantic, and for taxonomic lumpers far beyond (Hendrix, 1975). it is better known as P. strombi, but the validity (and propriety) of that emendation is not clear to the writer. 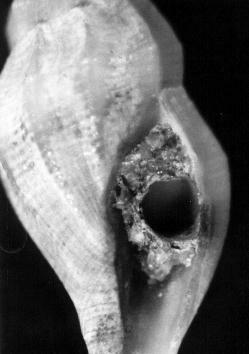 This species typically fashions a doorway to its conchological apartment by packing sediment, using mucus as mortar, around itself so as to narrow the shell's aperture to a circular inner passage (see photo below). As a rule an anterior channel is also constructed (see bottom of aperture - photo below). The latter allows for inflow of water when the introvert extends. Otherwise a vacuum would retard the worm's freedom of movement. The remains of these granular chimneys are in fact commonly observable in shells taken by Jake Mullis' dredge at Cedar Keys and from the Jacksonville beaches renourishment spoil. Indeed, virtually all specimens of the Red Tower Shell, Rubellatoma rubella (Kurtz and Stimpson, 1851) [hereby species no. 506 for the N. E. Florida checklist] collected by Bill Hanson in August, 1986 were remodeled in this telltale style. In a sense he (the writer and others secondarily) may thank P. strombus for pulling these shells into the dominion of the dredge's intake! But the worthy Sipunculid's services to conchologists does not stop here. Several of Bill's Red Towers had one to four tiny clams attached by byssal threads to the shell and chimney structures. The larger examples (see photo above) appeared to be adult despite their two millimeter length and were determined to be Pythinella cuneata (Verrill and Bush, 1898) [this makes species no. 507]. This species was described from empty shells dredged in 100 ft. depths off Cape Hatteras. Originally placed in Montacuta Turton, 1822, it was designated the type of new genus Pythinella by Dall the next year. That the relationship between this kind of clam and Phascolion is more than coincidental was shown by Perez (1924), who studied a close relative, Pythinella phascolionis (Dautzenberg and Fischer) around the chimney of Phascolion strombus living in the Top Shell Calliostoma zizyphinus (Linnaeus, 1758) of European waters. Hampson (1964) further described the commensal habits of P. cuneata with Ph. strombus in small snail shells found in Buzzards Bay, Massachusetts. Later Gage (1968) showed that these clams, when separated from their holdfasts, actively crawled back and reestablished themselves. Furthermore, the critters were attracted back to their niches by a chemical released into the water by the worm. Why Pythinella has adapted to such a specialized habitat is unclear, but once one has observed Ph. strombus burrowing, raking, and generally thrashing about, he can appreciate the services of the worm to the clams, which depend on suspended detritus and ample water flow for their livelihood. It appears that Ph. strombus is not a reciprocal beneficiary, and, should the mass of its cohort clam colony become excessive, might even be hobbled and unable to feed efficiently. This kind of symbiosis is best termed "commensal," a term derived from Latin and indicating that two (or more) living things eat "at the same table." It is used along with terms like parasitism and mutualism to lend insight into the give and take between organisms living on, in, or very close to one another by more than mere chance. Examples of parasitism among local marine invertebrates include the Cucumber Shell Eulima jamaicensis C.B. 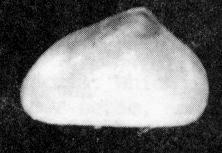 Adams, which can be collected from just beneath the cuticle of the Burrowing Sea Cucumber Holothuria impatiens on the Cedar Key flats, and the Impressed Odostome Boonea impressa (Say, 1822), which often inserts its proboscis into the mantle cavity of the oyster Crassostrea virginica (Gmelin, 1791). A fine discussion of mutualism is given by June Dawley (1977) in the case of the Texas Longhorn, a crab - bryozoan association. One must marvel at the "ingenuity" that evolutionary forces allow life forms to exhibit. Shell collectors are in an enviable position to gain appreciation of these biological phenomena - even to discover the secret ways mother nature has weaved the marvelously complex web of life. 1. Dawley, D. June (1977) A Minor Marine Miracle Shell-O-Gram 18(12): 3-4 (December). 2. Gage, John (1966) The mode of life of Mysella cuneata, a bivalve 'commensal' with Phascolion strombi (Sppunculoidea) Can. J. Zool. 46: 919-934. 3. Hampson, George R. (1964) Redescription of a commensal Pelecypod, Rochefortia cuneata, with notes on ecology Nautilus 77(4): 125-129 (April). 4. Hendrix, Gary Y. (1975) A review of the genus Phascolion (Sipuncula) with the description of two new species from the Western Atlantic in Mary E. Rice and Maksim Todorovic (eds.) Proc. Int. Symp. Biol. Sipuncula and Echiura 2 vol. Kotor, Yugoslavia. 5. Laverack, M.S. and J. Dando (1979) Essential Invertebrate Zoology second edition pp i-vii + 1-194. Wiley, New York. 6. Verrill, Addison E., and Katharine J. Bush (1896) Proc. U.S. Nat. Mus. 20(1139):782 & plates 91:4,93:5. Acknowledgement: I thank Dr. A. Quinton White (Jacksonvile University) for assistance in gaining access to the Sipunculid literature.